The New England Patriots will have to defend their latest Super Bowl title without wide receiver Julian Edelman. The team announced Saturday that Edelman has been lost for the entire 2017 season because of a knee injury. ESPN’s Adam Schefter has since reported that Edelman suffered a torn ACL. Edelman suffered the injury during New England’s preseason game Friday against the Detroit Lions. The 32-year old Edelman was running free in Detroit’s secondary after making a catch when he suffered the non-contact injury. Edelman quickly got up and was able to limp off the field. However, he was soon taken by cart to the locker room and not seen for the rest of the night. For Edelman, the injury comes at an unfortunate time in his career, as he’s coming off one of his best seasons. Last year, Edelman caught 98 passes, the second highest of his career. He also set a new career-high with 1,106 yards receiving despite finding the end zone just three times. Edelman then added 21 catches and a touchdown during the playoffs. He also played in all 16 regular season games for just the second time in his career. The Patriots rewarded him with a three-year, $15 million contract in June. In typical Belichick fashion, the head coach was already working on how the Patriots would survive the season without Edelman within a few hours of the injury being announced. The loss of Edelman means that Brandin Cooks may very well end up being Tom Brady’s top target this season. Cooks came to New England over the summer in a trade with the Saints. After a modest rookie year in New Orleans, Cooks was outstanding the past two seasons and one of the best pure athletes Brady has had at receiver in several years. The Patriots will also have to rely more on Chris Hogan and Danny Amendola, with Amendola likely to spend a lot of time in the slot. Running back Rex Burkhead could also end up spending time in the slot without Edelman available. Second-year receiver Malcolm Mitchell may also end up seeing a larger role in the offense as a result of Edelman’s injury. Of course, Brady also has Rob Gronkowski at his disposal, although Gronk has been injury prone himself in the past. Outside of Brady himself, Edelman may have been the one player the New England offense could least afford to lose. He has spent much of his career as Brady’s safety net and go-to receiver in tough spots. The Patriots have plenty of receivers capable of playing his position. However, none of them have the same chemistry with Brady or the knack for making the right play at the right time. 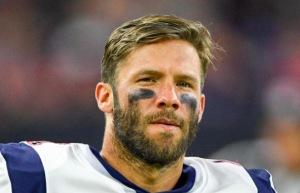 Losing Edelman for the season is definitely a serious blow for the Patriots.